Who We Are- The Ice Cream Kids! The Ice cream shop began with a little boys dream, and lots of hard work. Beck at the age of nine envisioned converting the family's old sheep barn into an Ice Cream Scoop shop, with the help of family and friends this young man’s dream came true. The heart, and soul of Sanctuary Dairy Ice Cream is quality ingredients, a sustainable future, and producing the highest quality ice cream with purees, and pastes from scratch. Our reputation is on the line with every scoop, and we stand behind our products. 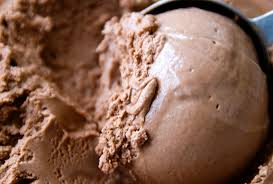 With years of practice we have refined those recipes to provide the best ice cream imaginable. The Johnson children Beck and Maranda, locally know as “The Ice Cream Kids” are tenth generation dairy farmers. 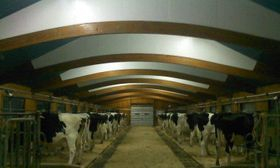 The family’s working dairy farm dates back to the 1700’s and is located on 750 acres of meadow and woodland, all protected by conservation easements in the village of Wendell (Sunapee) on John Paul Flats. Sanctuary Farm has miles of hiking trails, an abundance of wildlife, and a chance to enjoy nature. 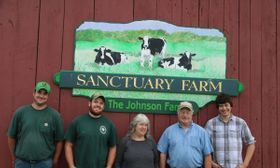 Sanctuary Dairy Farm has three generations of ice cream makers involved. 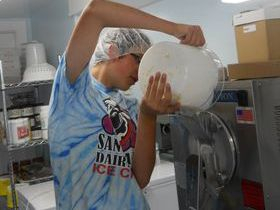 Unlike most generational businesses, it was the youngest of the family who had the vision that began Sanctuary Dairy Farm Ice Cream. Beck took the initiative to train the rest of the family, including his siblings, mother and grandmother. Becks secret recipes were passed up from mother to grandmother. Those secret recipes support local farmers and include blueberries from the Bartlett’s Farm and strawberries from Peachblow Farm. 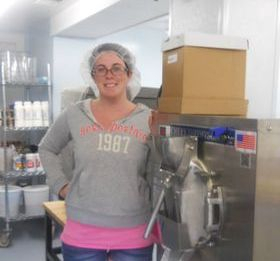 Beck’s accolades include certification from Penn State University for ice cream science, graduating from the Ice Cream University, and becoming ServSafe Certified. The family traveled to Italy to learn from the masters themselves in 2013. Our critiques have been our greatest teachers and we thank each and every one of you.